I've never been a fan of American football, so it's no surprise that the Super Bowl — the biggest annual competition for NFL freaks everywhere, not to mention one of the biggest sporting events, period — is of zero interest to me. Well, that's not entirely true — I generally tune in every year around halftime for the actual entertainment, just to see what's going on. 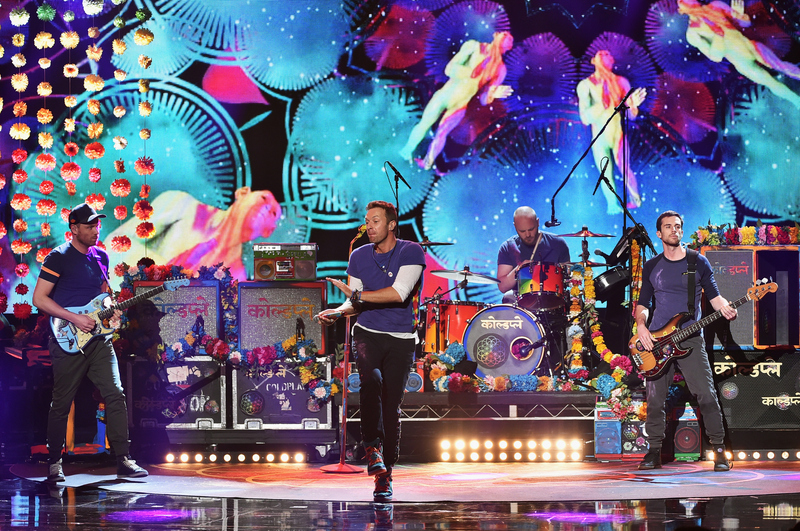 Of course, 2016 will be no exception since Coldplay are headlining the 2016 show. But that's not even the best news: it turns out Coldplay might welcome Beyonce and Rihanna to the Super Bowl halftime show, making what's sure to be an amazing show even more incredible. According to NME, via The Daily Mirror, Coldplay lead singer Chris Martin hopes that having such major pop stars added to the roster will bump up the "show" factor. After all, Coldplay is one of the biggest bands in the world and they put on an incredible show, but previous Super Bowl halftime show acts like Katy Perry and Madonna put on a more dazzling performance, complete with fancy costumes, backup dancers, the whole nine yards. That's not Coldplay's thing, but that's where Beyonce and Rihanna come in. A source told the paper: "Chris and his band know they’re not typically as showy as recent performers like Katy Perry and Madonna with all the dancers and, while they love a light show, they still want to bring a few surprises out. Beyonce and Rihanna are both keen to join in the high-profile ceremony and will add just the spark needed to make it an amazing and unforgettable show." Of course, this hasn't been confirmed officially yet, but no surprise there — the NFL has always tried to keep special guests and the like under wraps (unsuccessfully, but A+ for effort) ahead of the game to foster suspense. I don't expect them to come out and say that two of the biggest pop stars are joining one of the biggest bands at one of the biggest sporting competitions, do you? I've got faith that this is happening — or at least I'm just hoping that's the case. Coldplay has collaborated with both stars before — with Rihanna on "Princess Of China", one of the best tracks from Mylo Xyloto, and with Beyonce on "Hymn For The Weekend", which appears on their newest release, A Head Full Of Dreams. Likely they'll perform those tracks at the Super Bowl, but something tells me they'll have something else up their sleeves, as well. Frankly, I'm keeping my fingers crossed that this happens, because it'll definitely be one hell of a show.